Postal certified wall mounted 4C horizontal mailboxes meet USPS-STD-4C specifications, however mounting 4C mail receptacles on a pedestal for postal delivery requires a local postal official exception. 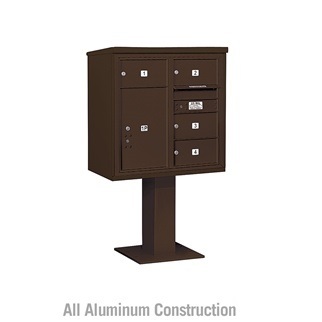 A compatible pedestal is included in pricing for 4C pedestal mailbox. USPS-STD-4C specification demands a one parcel locker for every ten tenant compartment proportion. 4C modules are constructed of aluminum and stainless steel hardware and are factory certified for indoor or outdoor use. Doors include a Compx heavy duty cam lock with a dust/rain guard and come furnished with 3 keys. Tenant mail compartment door is equivalent to two 3-1/4' high standard doors and is used for outgoing mail collection & as a master access door is marked "Outgoing Mail". Secure outgoing mail compartment door includes a 10-3/4" W x 3/4" H mail slot and weather sheltered hood. 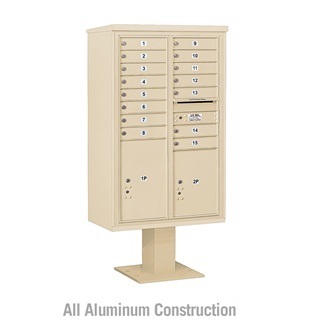 4C horizontal mailboxes mounted on a stand are available in front entry only. 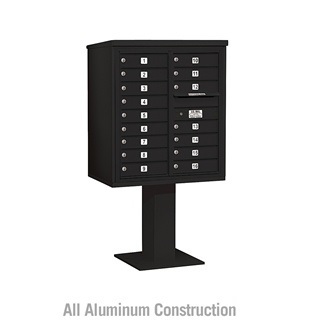 This high security pedestal mailbox is available in six attractive powder coat colors. (+$75.00) Custom engraved door identification for 4C pedestal mailboxes offers the customer a permanent clean door identification option. The engraved characters on your compartment doors will be silver with this door identification option because the unit is manufactured from aluminum. (+$75.00) Custom black filled engraving adds a touch of class to your mail receptacle. Each 4C pedestal mailbox door is engraved with the characters you specify and then filled in with a black ink to further distinguish the door identification.